Various pundits have picked up on the upcoming May 13 episode of AMC's Mad Men, which is titled Dark Shadows. The sixties-set drama has now reached 1966, the year that Dark Shadows debuted, sparking speculation that the show would be referenced in some form. Although viewers won't get to see Don Draper putting golf balls in Dan Curtis' office, we are pleased to confirm that Dark Shadows does indeed feature, in an interesting scene demonstrating Mad Men's trademark attention to detail. Look out for it! I've been hoping that this would happen I think it would be great if Sally was waiting for an autograph outside the studio or something. Well, this is just fabulous. Whatever the reason, I'm all about it. How far ahead is Mad Men production? I wonder if Hamm had anything to do with this little bit? Maybe he's even groovier than we thought he was? 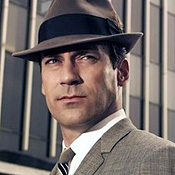 Mad Men is currently in the year 1966, but Barnabas didn't appear on the show until 1967. The scene is authentic to 1966, so no Barnabas. It's not one for the casual viewers, but I think fans will get a kick out of it. Last week I thought maybe it would be something to do with the grandmother's broken ankle, causing her to sit at home all day and watch soaps, but after last night's Mad Men, I am wondering if Megan will go for a Dark Shadows audition? I don't have Cable TV but none the less how so very "cool" of MAD MEN to pay Tribute to the haunting Classic DARK SHADOWS in their own special way. Awesome!